The 41st Annual WNC Home & Garden and Green Living Show (HGGL) is getting bigger and better by the minute! The premier green living three-day event in Asheville has partnered with the Southern Energy and Environmental Educational Series (SEE EXPO) and will be held at the U.S. Cellular Center in downtown Asheville March 18-20, 2016. With over 200+ exhibitors expected to participate in this year’s show, attendees will experience a collaboration of products and services for the home, garden and an eco-friendly lifestyle plus 40+ all-new educational workshops with topics including: energy efficiency, urban gardening, eco-transportation, sustainable building, and the latest in green living trends. Tim Alexander, director of Peak Productions and the Home Garden and Green Living Show says" There are some exciting new reasons to come to the show this year. Not only are we offering 40+ ALL NEW green living workshops, we have a test drive electric vehicles area and over 3 floors of 200+ exhibitors to explore!" Ned Ryan Doyle, Doyle, Educational Coordinator for the 2016 Home, Garden & Green Living Show and formerly Director of the Southern Energy & Environment Expo from 2001 through 2010, said, “It’s exciting to team up with the longest running Home Show in WNC again and 40+ workshops to help folks "go green" in and around their communities. The best part is that all of the workshops are included in daily general admission!" The 41st Annual WNC Home & Garden and Green Living Show is back and it’s bigger and better than ever. The premier green living event in Asheville has partnered with the Southern Energy and Environmental Educational Series (SEE EXPO) and will be held at the U.S. Cellular Center in downtown Asheville March 18-20, 2016. As the longest running and most attended WNC Home Show, it will feature products and services for the home and garden as well as dozens of new seminars and workshops with topics ranging from electric vehicles, solar energy, sustainable gardening and everything in between! To join this event or for more information, visit http://www.homegardenandgreenlivingshow.com. 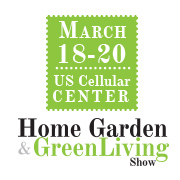 Tickets are available in advance on the show website: http://www.homegardenandgreenlivingshow.com or at the show office at the U.S. Cellular (formerly the Civic Center) Box Office, on website and are on sale during event hours. All tickets include daily seminars and workshops.